JS3Upload is a JFileUpload add-on that allows to upload files to Amazon Simple Storage Service (S3). End-user can select files and folders with subfolders from a file chooser or through drag and drop. Amazon S3 REST and SOAP support. Upload files and folders to a bucket. US, EU and Asia bucket support. ACL parameter for uploaded object. Large upload support with resume (up to 5TB). Policy support for anonymous form POST upload. See online documentation for JS3Upload installation and samples. FAQ is also available. You can try S3Upload add-on here. 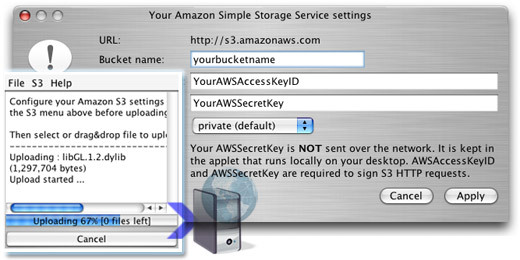 You have to setup your S3 setting (AWSAccessKeyID, AWSSecretKey and target bucket name) through S3->Settings menu before uploading. Front-end uses Java look and feel.